The RESPONSIVE is the One Who answers the prayers of the supplicant when he calls on Him. Allah says, “..call on Me; I will answer your prayer.” (GHAFIR, 60); He answers the prayers by His loving Kindness so that the supplicant is either granted what he wants and what is more blessed and beneficial to him, or He turns away from him evil equal to the bliss of what he asked for. Allah, Praise and Glory be to Him, says “Or who listens to the soul distressed when it calls on Him, and who relieves its suffering” (NAML, 62). 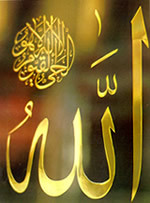 He, alone, knows perfectly and fully the need of the necessitous before they supplicate Him, He has known these needs since eternity, so He has planned and created the means for answeringprayers before they are even uttered; He is the Bestower of Favours beforesouls call on Him; Praise and Glory be to the RESPONSIVE, He is Allah.